Picture and file hosting has established credentials as a business idea. As the cost of storage has rapidly decreased as social networking has boomed picture hosting has been a hot vertical. There’s no shortage of sites in this space, and easy money to be had. At the very top Photobucket was acquired by MySpace for $250 million. To date free file hosting sites have been just that: free file hosting where essentially you get a service for free and the operators keep the profits from the site. Shareapic wants to change that. If in month one Shareapic calculates to distribute $1,000 to our members, we will first tally up the total number of image views for that month. Using these two numbers we can determine the respective payouts for each user. If there were a total of 500,000 image views for the month, image views will equate to $0.002 each (1,000 divided by 500,000), or $2 per 1000 image views. If you’re posting lots of pics in forums, MySpace or eBay, you can see how easy it is to earn quite a bit of money! Perhaps the only draw back is that Shareapic doesn’t disclose the revenue share; it may lack transparency but it’s still more than other sites pay in this space, which is zero. We’ve covered two other companies that paid members to participate today, AGLOCO which went to the deadpool, and Capazoo, both of which had dubious multi-level marketing schemes (some would suggest pyramid schemes) and usually come with a catch. 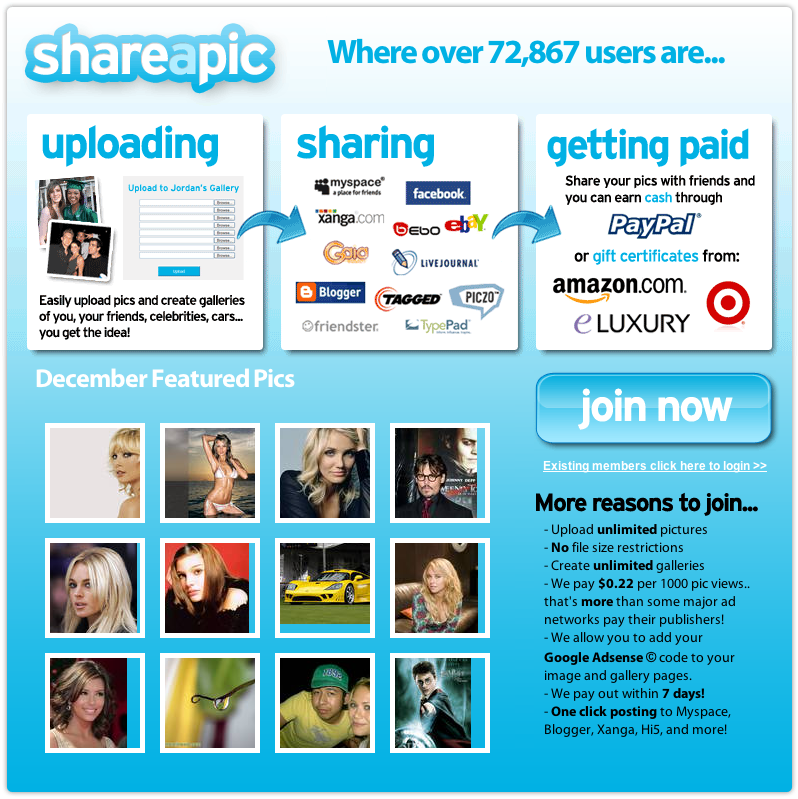 By comparison Shareapic has an honest model, so honest in fact that it should be the way of the future. What Shareapic does is recognize that users of a free service provide a financial benefit to the provider, and that in return profits provided by user participation should be shared (at least in part) back. Imagine the hours and hours put in by Facebook users or users of other sites; they may be free services but the providers benefit from each participant, and in the case of Facebook’s valuation, greatly. Expect to see more sites like Shareapic who value their users to the point that they offer financial rewards in return; it’s not only a smart marketing pitch it’s also fair recognition of your time and your effort in a market where many have business models that expect a free ride from their users. Build it and they will come may well be replaced with reward them for their time by sharing profits, and we’ll all be the winners from that.